Every now and again I find myself compelled to put on my reviewer hat and review something I bought. Sometimes it's because it's a new item that not to many people have seen, or it's something I think will help people, or sometimes it's me being a pompous buffoon thinking that I have something wise and enlightening to share with other people (usually it's this last one). In any case I try to make things as logical and thorough as possible and I hope that some of these are useful to someone out there. 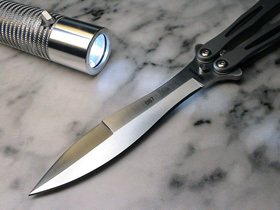 Knife Reviews This is probably where there is going to be the most activity since this is where I have the most experience out of all of my interests. Flashlight Reviews I'm not that knowledgeable in the flashlight area, but I sometimes come across obscure items that people might know about or newly released items that people haven't gotten yet. Miscellaneous Reviews This is where all the other stuff goes just in case I decide to use my genius for other things. Publications I have had one request to write an article so far and maybe after other people recognize my genius I will be asked to write more things. But until then enjoy my one bright, shining moment as an author.